Tuscaloosa, Alabama: Perkolator Press, 2018. Edition of 15. 8 x 5"; 14 pages. Reduction linocut. Letterpress text. Drum leaf binding. 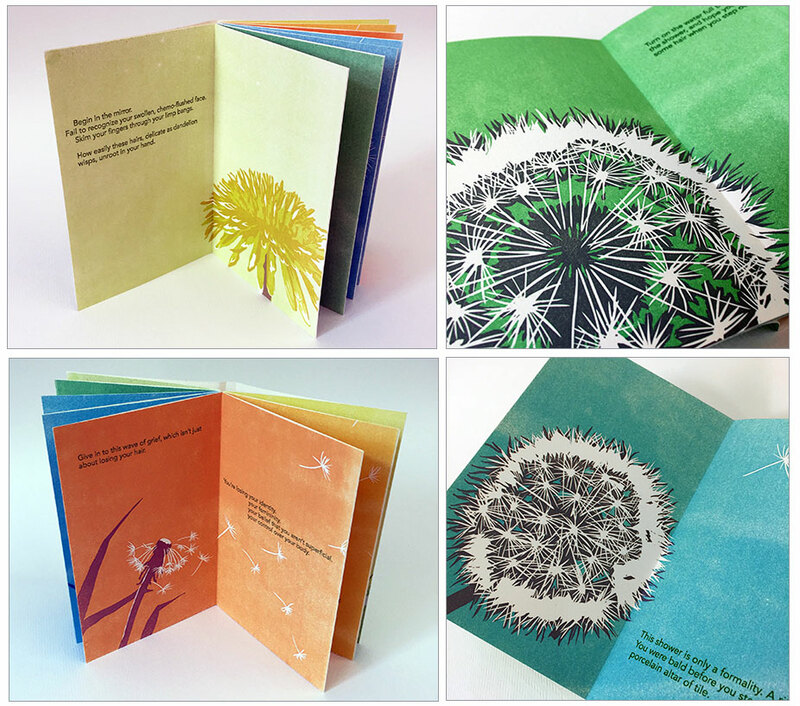 Book design, letterpress printing, linocuts, and drum-leaf binding by Amy Pirkle. Signed and numbered by the artist. Amy Pirkle: "How to Lose it All at Once features excerpts from a longer piece of non-fiction by my twin sister, Sara Pirkle Hughes, about the experience of losing all of her hair while going through chemotherapy at age 33. We began work on this book during the summer of 2017 at The Anderson Center in Red Wing, Minnesota, where we were surrounded by endless fields of dandelions. The dandelions transitioning from bright gold flowers to white orbs to wisps floating on the wind seemed to illustrate her text beautifully. 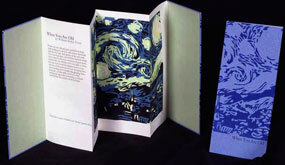 "Each two-page spread in the book is a full-bleed reduction linocut, with letterpress text printed on top. " Tuscaloosa, Alabama: Perkolator Press, 2011. Edition of 19. 4 x 5.5"; 12 pages. Two-color screen prints. Letterpress printed text from metal types in the typeface Della Robia. Drum leaf binding with screen printed covers. Amy Pirkle: "I was diagnosed with vertigo last September after a particularly bad (3-day long) episode, so this book is about the things that make me feel better whenever I am having a bout of vertigo. The colors aren't represented as well through the photographs, but I've tried to pair up colors that vibrate against each other as the reader looks through the book, to kind of replicate the dizzy feeling one gets if she has vertigo. "I printed Vertigo at Penland School of Crafts during a week-long retreat for instructors in September 2011, shortly after having been diagnosed with vertigo. The imagery represents things that make me feel better when I am experiencing vertigo, including water, cool air, sleep, and turning off the lights. " Tuscaloosa, Alabama: Perkolator Press, 2010. Edition of 27. 5 x 7"; 16 pages. Letterpress printed from linoleum, wood type, and metal type. 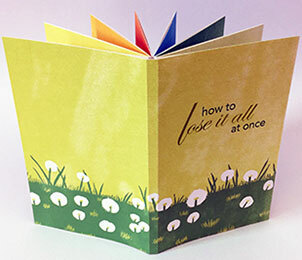 Amy Pirkle: "I began printing this book during my winter residency at Penland School of Crafts after having a conversation about happiness with my friend and fellow master printer there, Bill Hall. We took turns naming things that make us happy; this book is that conversation. For the record, Donald is Bill's cat." 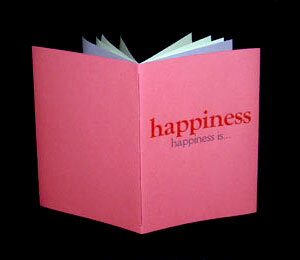 Each letter of HAPPINESS IS has its own page with one of the happiness items that Amy and Bill shared. Tuscaloosa, Alabama: Perkolator Press, 2009. Edition of 20. 6 x 6"; 16 pages. 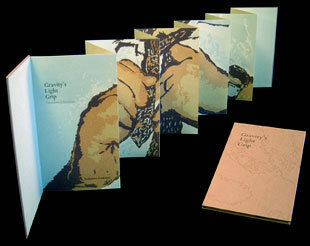 Design, imagery, text, and letterpress printing by the artist. Printed from linoleum blocks and metal type. Snake fold printed on both sides. Boards bound in blue cloth with paper title label on front board. 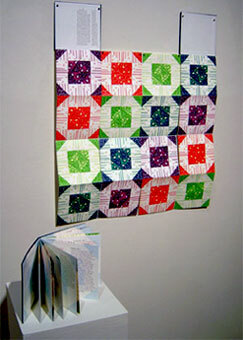 "I felt that quilt imagery was appropriate for this book on two levels. For one thing, I enjoy sleeping and dreaming underneath a quilt, and for another, quilts are traditionally made with scraps of cloth sewn together in much the same way that my dreams are composed of scraps of memories and thoughts that I've compiled throughout the day. The book has been printed on both sides so that it can be read as a traditional codex form, but it can also be unfolded to hang as a quilt with the full-color sides visible." Tuscaloosa, Alabama: Perkolator Press, 2006. Edition of 30. 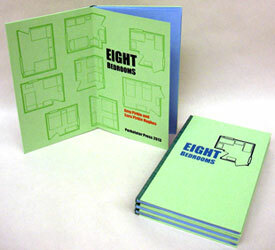 9 x 4 ", extends to 9 x 24 "; 4 pages. Accordion structure. 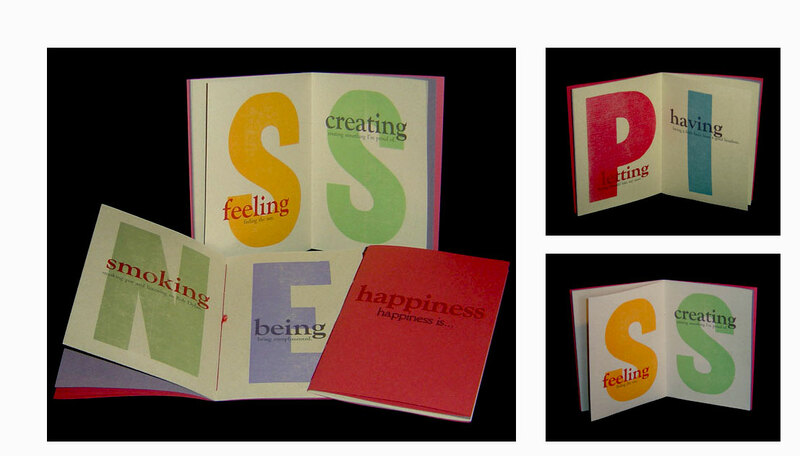 Text printed letterpress in two colors, the image, a reduction linoleum block, in four. Cover papers 100% cotton rag handmade by the artist. Amy Pirkle: "This is my favorite poem by W.B. Yeats. The speaker in the poem asks the young woman he loves to remember him when she is old and grey and full of sleep. He wants her to know that although other men loved her for her beauty or grace, he was the one man who loved the pilgrim soul in her. He wants her to regret the fact that she did not return his affections, and to murmur, a little sadly, how Love fled and paced upon the mountains overhead and hid his face amid a crowd of stars. 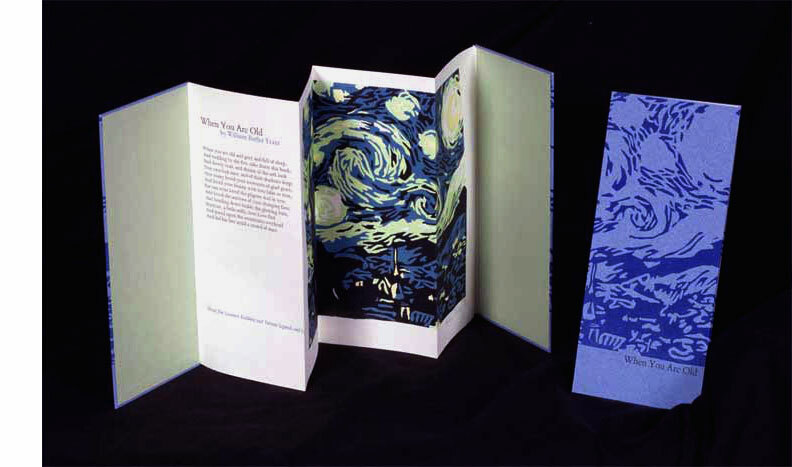 The image, a four color reduction linoleum block, is a study of Van Gogh's Starry Night and perfectly accentuates the words of the poem." 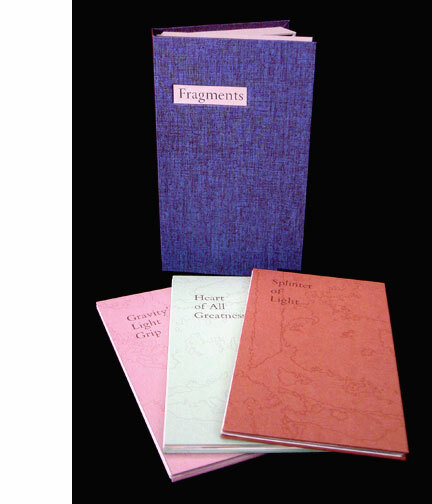 A series of three poetry books by Amy Pirkle in collaboration with the poets. Each book is published in an accordion structure. The books come individually or in a boxed set. Amy Pirkle: "As for the imagery in this accordion binding, I was able to create one large image out of five smaller panels. 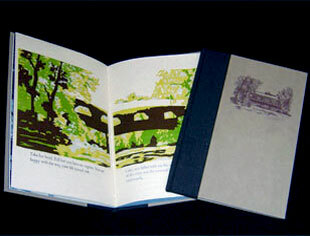 When opened to a two-page spread, the poetry on the verso side of the page interacts with an abstract 4-color image that makes sense only when combined with the other panels in the book. Memories are often just fragments of images combined in our minds to create an entire picture. In many ways, my own memories about my father are just flashes of moments that I've blended together over time. I printed this book to better understand my own father and the relationship I have with him." Tuscaloosa, Alabama: Perkolator Press, 2007. Edition of 65. 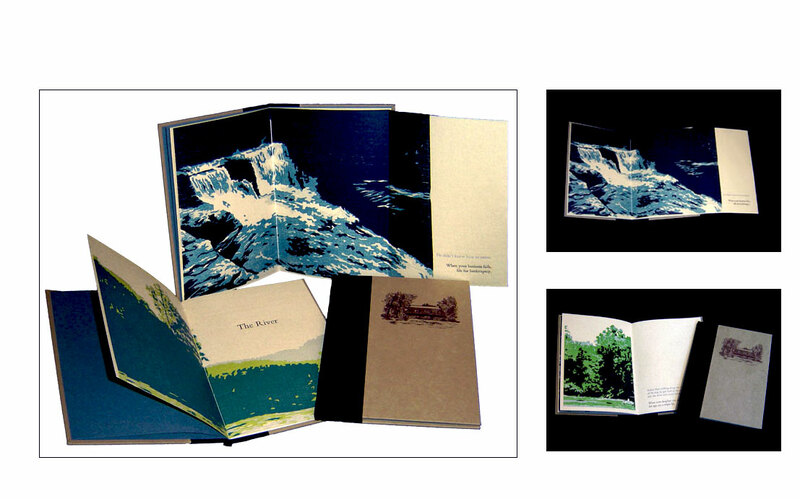 8 x 4.5" closed; 8 x 54" extended; 10-paged accordion book with hardcover binding. 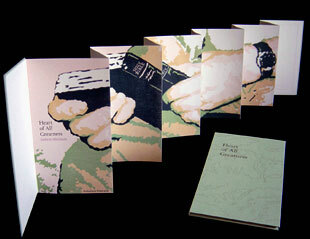 Five full-color illustrations relief printed from color reduction linoleum blocks, which, viewed from the side when the book is open, form a single image. Hahnemühle Biblio (white) and Bugra (antique rose) papers, plus binder's board. Letterpress printed from metal types (Dante and Spectrum Roman). Photopolymer plate line drawing on covers. Amy Pirkle: "Fathers are complex figures in our lives; a subject I felt needed to be explored through imagery and words. Through his poetry, Gordon Johnston shows just how complex this relationship can be between a father and his child. From a frustrated father teaching his son how to knot a tie unsuccessfully and finally giving up, to a new father watching over his infant sleep and taking a moment to calm his nerves, Gordon show the wide spectrum of emotions a father can feel. 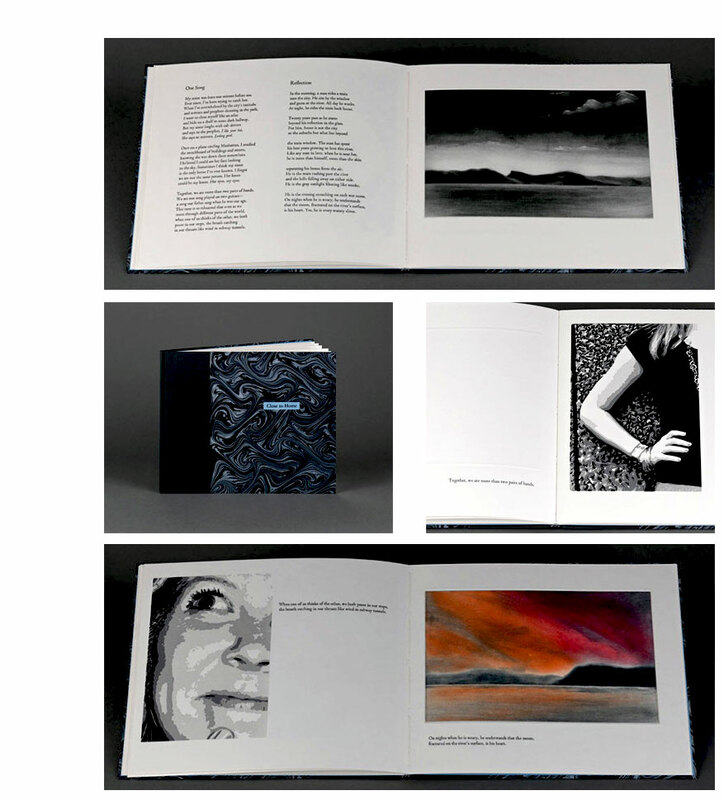 "As for the imagery in this accordion binding, I was able to create one large image out of five smaller panels. 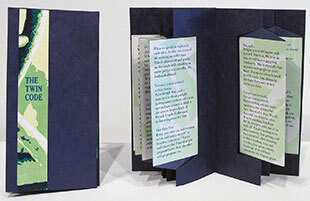 When opened to a two-page spread, the poetry on the verso side of the page interacts with an abstract 4-color image that makes sense when combined with the other panels in the book. Memories are often just fragments of images combined in our minds to create an entire picture. In many ways, my own memories about my father are just flashes of moments that I've blended together over time. I printed this book to better understand my own father and the relationship I have with him." The title of the book comes from words in Gordon Jenkins' "Night Father," the second of three poems presented here. 4.5 x 8" closed; extends to 54"; 10 pages. Accordion structure. 5 full-color illustrations. Materials: Hahnemuhle Biblio (white) and Bugra (mint) papers, binder's board. Techniques / Processes: letterpress printed from metal types (Dante and Spectrum Roman); relief printmaking (color reduction linoleum blocks); photopolymer plate line drawing for covers. Design, printing, and artwork by Amy Pirkle. Poems by Judson Mitcham, reprinted with his permission from This April Day (Anhinga Press, 2003). Amy Pirkle: "Through words and imagery, Heart of All Greatness explores the subject of fathers as complex figures in our lives. Judson Mitcham's poetry examines true tenderness between a father and son, particularly in a family where secrets are kept to prevent embarrassment, and expressing full emotion may be awkward. With beautiful and heartbreaking language, Mitcham captures the loss that a son feels for his father after he passes away, thinking about him often when 'alone in a strange place' ("A Postcard to My Father"), and realizing only after his death that he understands his father in a way no one else in his family does ("Writing")". 4.5 x 8" closed; extends to 54"; 10 pages. 5 full-color illustrations. Accordion binding. Materials: Hahnemuhle Biblio (white) and Bugra (brick) papers, binder's board. Techniques / Processes: letterpress printed from metal types (Dante and Spectrum Roman); relief printmaking (color reduction linoleum blocks); photopolymer plate line drawing for covers. Poems by Billy Collins, reprinted with his permission from Nine Horses (Random House, 2002) and The Apple That Astonished Paris (The University of Arkansas Press, 1998). Design, printing, and artwork by Amy Pirkle. Amy Pirkle: "Splinter of Light contains four beautiful poems about fathers by Billy Collins. Fathers are complex figures in our lives, so I felt driven to explore this idea through words and imagery. The stories in these poems study the influence fathers have on sons, from a father's effect on his son's driving, even after death, to a son pondering his father's effect on his writing while comparing him to Kerouac. These poems also capture tender and heartbreaking moments. In "The Stare," a son shaves his elderly father while finding it 'impossible to remember such closeness,' while in "Cancer," a father deals with a cancer diagnosis by pretending his son is saying 'campfire.'" Tuscaloosa, Alabama: Perkolator Press, 2014. Edition of 14. 5 x 8.5" closed; 14 pages. Doubled sided accordion with two pop-up elements. Letterpress printed from handset metal types on Johannot mouldmade paper. Linocuts. Pochoir. Cloth-covered boards with kite tipped on front board. Designed, printed, and bound by Amy Pirkle. Signed by poet and printer. Numbered. Of the edition 10 available for sale. Amy Pirkle: "Hands features a poem written by my twin sister, Sara Hughes. It was originally titled 'My Twin Sister in the Print Shop,' and is an excerpt from a longer poem. The first line states 'Our hands are matching origami kites.' The poem considers one struggle that all artists face, and especially one that she and I often contemplate: 'the grief, the prayers that any of this matters.' 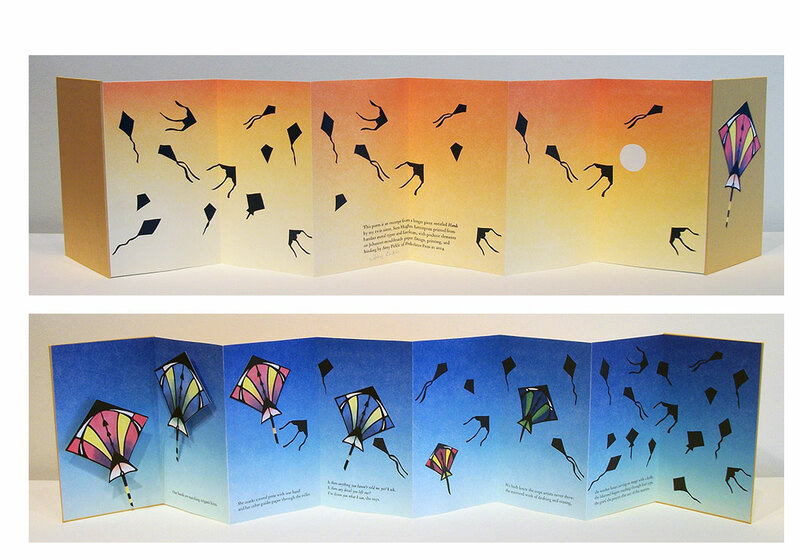 The pop-up kites that represent us, so boldly colorful and prominent at the beginning of the book, begin to grow smaller and fade away as the poem continues." Tuscaloosa, Alabama: Perkolator Press, 2014. Edition of 10. 4.5 x 9"; accordion with 6 swing panels. Letterpress printed from handset metal types and reduction linocuts on Arches textweight paper. 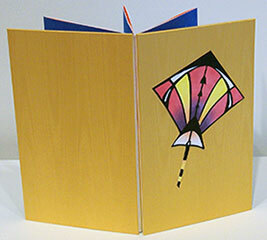 Bound with navy blue Nepali Lokta paper as a swing-panel accordion. Signed and numbered by the artist. Amy Pirkle: "My identical twin sister and I share an understood code. One might argue that it is written into our DNA, but certainly it developed long after we were born. The rules in this book are just some of the many unspoken, yet implied, principles that we follow. ... The text is hidden on panels behind a large image of a DNA strand, reinforcing the idea that as identical twins, our genetics are identical and this code of rules is written into our DNA. " Tuscaloosa, Alabama: Perkolator Press, 2012. Edition of 20. 4.125 x 6.5"; 14 pages. Flagbook structure. Letterpress, reduction linocuts, and archival inkjet prints. Bound in paper-covered boards. Signed and numbered by Pirkle on the colophon. Colophon: "All images are based on snapshot that my grandfather, Lee Pirkle, sent home to his family during his time overseas in the early 1950s. His cursive handwriting is from the backs of these photos, written when he was 21 years old. He wrote the narrative reflecting on this time almost 60 years later." Amy Pirkle: "I printed A Real Fighting Man in the summer of 2012, after spending a few days with my grandparents in south Georgia. My grandfather had recently celebrated his 80th birthday, and my aunt had gathered some snapshots of him in Korea in the early 1950s to share with me. She also had an essay he had written a couple of years ago, reflecting on his time in the army (written almost 60 years after he served). The essay and the photos instantly inspired me, mostly because of the descriptions my grandfather had written on the backs of the photos, including the phrase 'A real fighting man' on the back of a picture of him in his uniform (the photo that appears on the flags in this book). 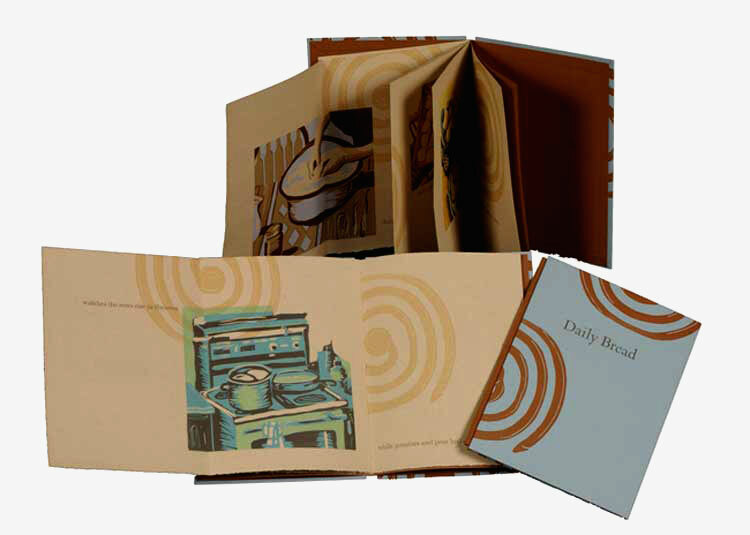 "The front cover and back cover images are reduction linocuts based on two of these snapshots, while the spine image and flags are archival inkjet prints from two other photographs. I scanned the faded handwriting from the photos and developed photopolymer plates to replicate his cursive in the book. The text and cursive have been printed letterpress on Mohawk cover stock, and the book is bound in a flag book binding." Tuscaloosa, Alabama: Perkolator Press, 2010. Edition of 35. 5.5 x 7.125"; 18 pages. 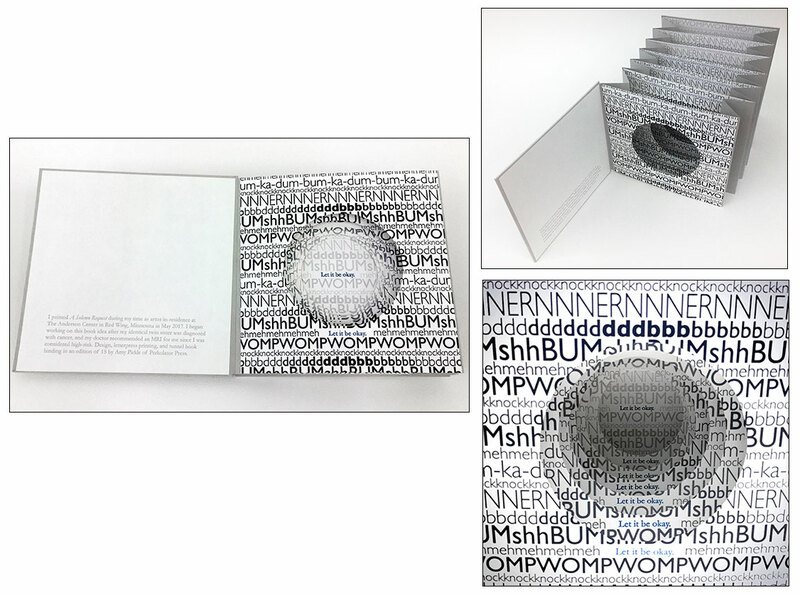 Design, imagery, text, and letterpress printing by the artist. Printed from metal type and reduction linoleum cuts on Nideggen paper. Cover image is a scratch negative photopolymer plate. Bound in paper over boards with cloth spine. Amy Pirkle: "I printed The River during my time as master printer in residence in letterpress at Penland School of Crafts in February 2010. There are two narratives working side by side throughout the book. One is a first-person account of a tubing trip down the Broad River that my father and I took in the Summer of 2008; the other is told in second-person and instructs the reader on how to live one's life, following examples from my father's life from the ages of 18-54 years old. The images throughout are based on photographs I took of the Broad and French Broad rivers in North Carolina in the summer of 2008. I had been working on the book idea for a few months before I arrived at Penland, and I felt that there was no better place to print it than at Penland because it is only an hour from the river." Tuscaloosa, Alabama: Perkolator Press, 2006. Edition of 45. 4.75 x 6.25" closed; 18" extended; 16 pages. Five color illustrations, relief printed from color reduction linoleum blocks. Nideggen mould-made paper, Fabriano Ingres paper (sky blue and rust), linen thread, and binder's board. Letterpress printed from metal types (14 pt. Walbaum). Bound as a hardcover pamphlet with fold-out pages. Design, printing, artwork, and text by Amy Pirkle. 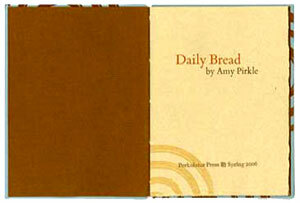 Amy Pirkle: "It seems as though every society, every culture, has a traditional bread associated with their cuisine. For Southerners, a true southern dinner includes homemade buttermilk biscuits on the side. As far back as I can remember, I knew that when I walked into my grandmother's kitchen in South Georgia, I'd find her in the kitchen with a hot batch of biscuits made from scratch. I printed this book as a tribute to her and to celebrate such simple pleasures as homemade biscuits at Sunday dinner with family." [Gordo, Alabama]: Combo Press, 2013. Edition of 15. 12 x 8"; 7 leaves. Printed on Hahnemühle Copperplate paper. Six aquatint etchings by Bill Hall. 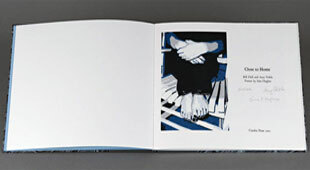 Letterpress, book design, and binding by Amy Pirkle. Poem by Sara Hughes. Black Asahi bookcloth covered boards with an aquatint etching inlaid on the front cover. Red Moriki paper accordion spine. 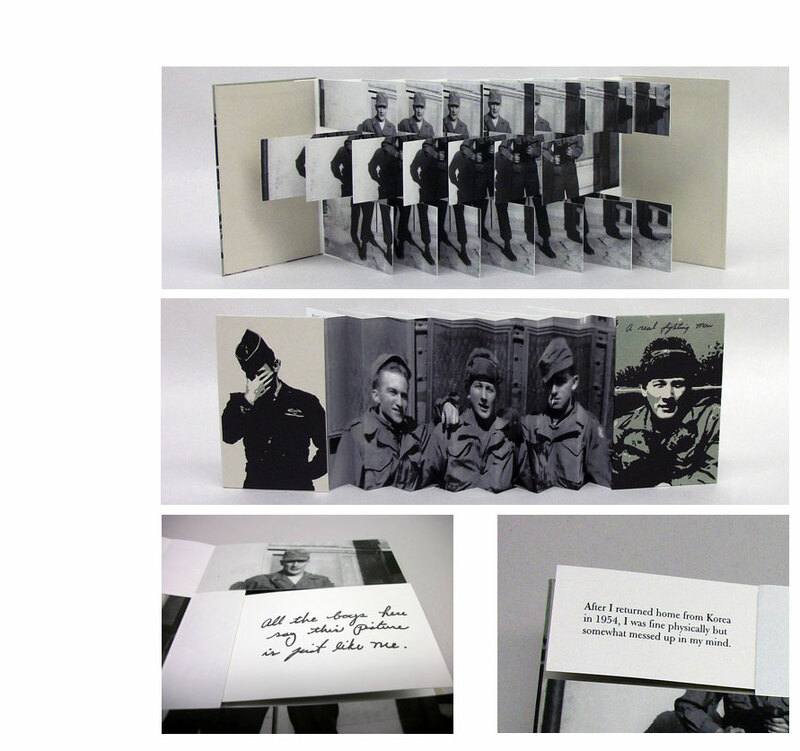 Bound in a hybrid style between an accordion book structure and a flag book structure. 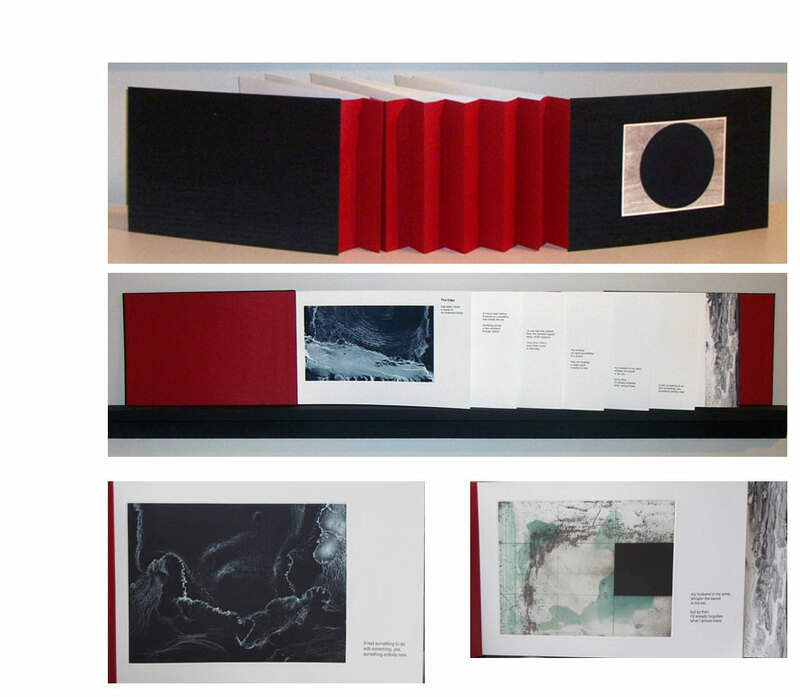 The Edge is a collaboration between Amy Pirkle (book designer), Bill Hall (printmaker), and Sara Hughes (poet). Combo Press: "Sara Hughes' poem 'That Edge' was originally published in Ouroboros Review, Issue 5, with the title 'The Secret of Life.' It was written as a response to Denise Levertov's 'The Secret.'" Levertov's poem speaks of the power and mystery of poetry; Hughes' poem speaks to a power and mystery of life that is at once more personal and more general. Sara Hughes poems and reviews have been published in Rattle, Rosebud, Arts & Letters, and Love Poems and Other Messages for Bruce Springsteen: An Anthology. New York printmaker Bill Hall has worked at Pace Editions for over 20 years, nurturing his love for intaglio prints. Gordo, Alabama: Combo Press, 2011. Edition of 25. 11.125 x 9.25"; 30 pages. Aquatint etchings and reduction linocuts printed on Magnani Incisioni paper. Metal type, Centaur, handset and letterpress printed. Case bound with Brillianta cloth and French Marbled paper. Hahnemühle Bugra endpapers. Colophon: "Close to Home is a result of a yearlong collaboration between Bill Hall and Amy Pirkle whose friendship began while teaching at Penland School of Crafts. Conversations about the things that make one feel connected to a particular place led to the title. They independently chose images that related to their ideas of home. For Bill, it was the Hudson River, so familiar to his daily commute. For Amy, the idea of home was inseparable from her twin sister, Sara Hughes. Sara composed the poems that bound their visual ideas together." Tuscaloosa, Alabama: Perkolator Press, 2013. Edition of 20. 5.5 x 9"; 20 pages. 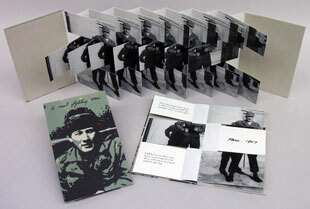 Letterpress printed text and photopolymer images with linocuts on Hahnemühle Bugra paper. Drum-leaf binding. 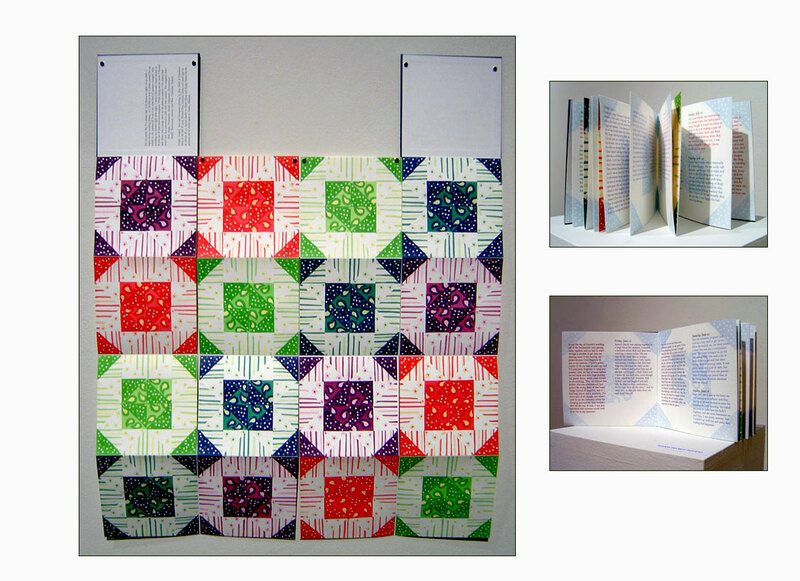 Quarter cloth of Aqua Iridescent Asahi bookcloth with paper-covered boards. Signed and numbered by Amy Pirkle and Sara P. Hughes. 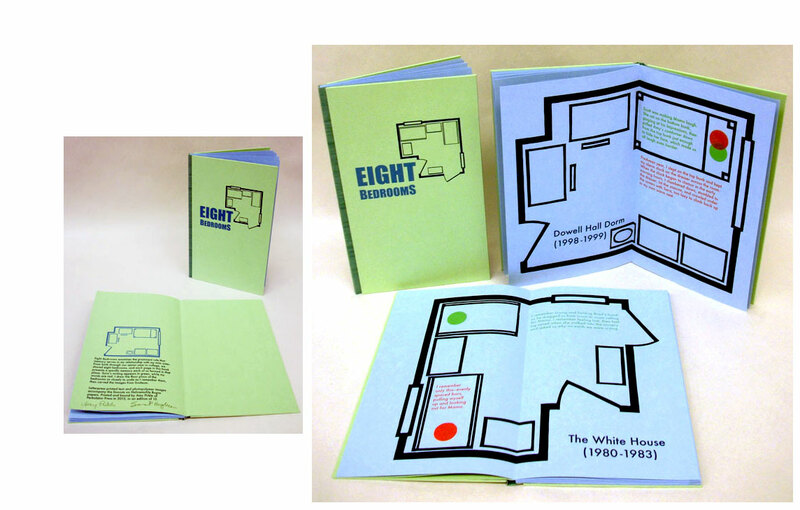 Amy Pirkle: "Eight Bedrooms examines the prominent role that memory serves in my relationship with my twin sister. From birth through our senior year in college, we shared eight bedrooms, and each page in this book presents a specific memory each of us formed in that place. Sara and I both wrote the text for the book; I letterpress printed her memories in green and mine in red. On each page, I used a pochoir technique to create a matching circle to represent where each of us slept in that room. "I drew the floor plans of each bedroom as closely to scale as I remember them, then carved the images from linoleum. These drawings were scanned and converted into small photopolymer images for the title page and cover imagery." Tuscaloosa, Alabama: Perkolator Press, 2007. Edition of 25. 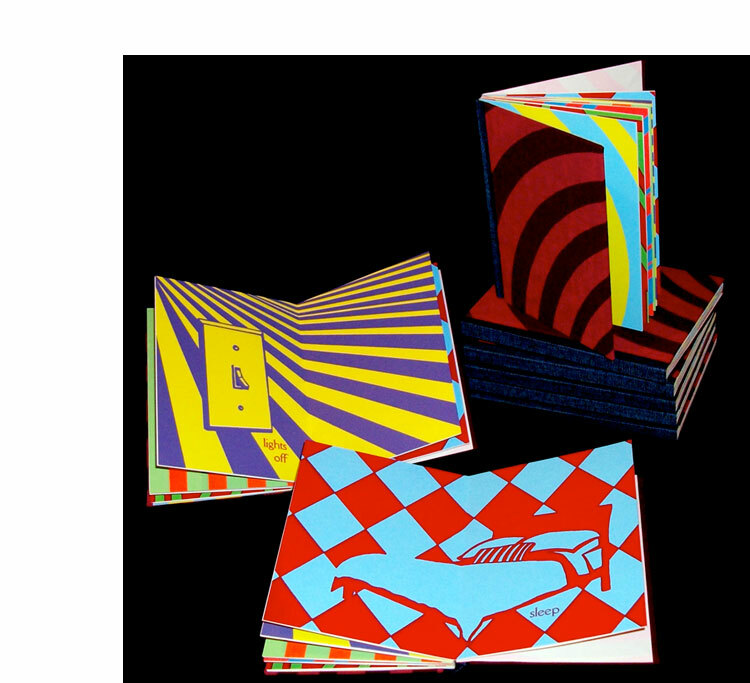 Three hardcover accordion books housed in 5.125 x 8.625" clamshell box. Materials: Hahnemuhle Biblio and Bugra papers, Nile duo-tone bookcloth, binder's board. Techniques / Processes: letterpress printed from metal types (in Dante and Spectrum Roman) and photopolymer plates (drawings for covers of books); relief printmaking (color reduction linoleum blocks). Design, printing, and artwork by Amy Pirkle. Amy Pirkle: "Fragments is an investigation of the relationships between fathers and their children, and more specifically, the relationship between my father and me. These books attempt to illustrate the idea that memories are often just fragments of images combined in our minds to create an entire image. 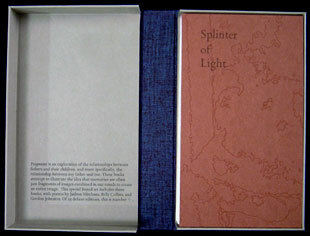 This special boxed set includes three books (Heart of All Greatness, Splinter of Light, and Gravity's Light Grip), with poems by Judson Mitcham, Billy Collins, and Gordon Johnston." 2 x 4 x .75"; 8 scrolls. Letterpress printed from 12 and 14 point Centaur metal types and linoleum cuts. Each scroll topped with 1" brown band at top to resemble a filter tip cigarette. 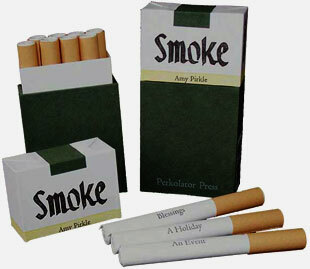 Housed in a hand-crafted cigarette pack made of binder's board with letterpress printed graphics; lift-off top. Features of the cigarette box: UPC code numbered and barred with life dates of Aubrey Thomas; WARNING: developed for this edition. 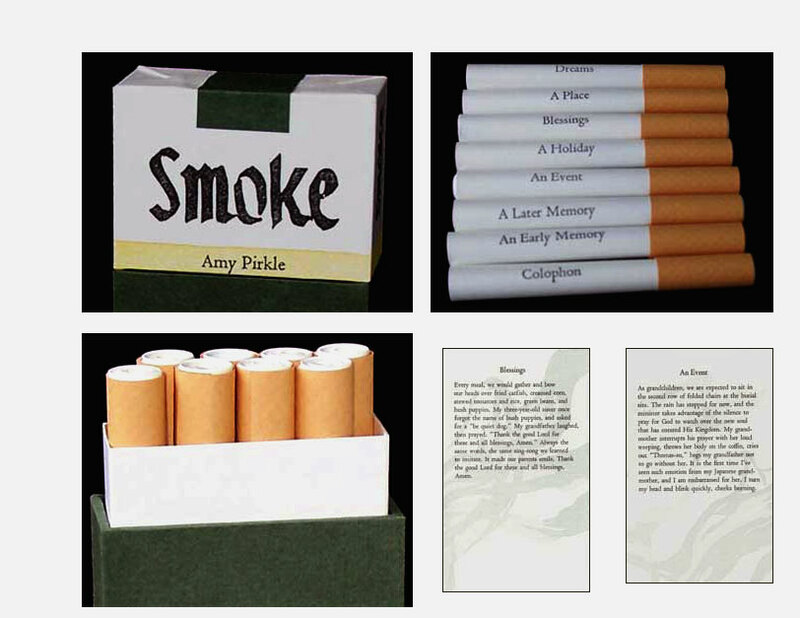 Amy Pirkle: "Smoke is a book project about my grandfather, Aubrey Thomas, who died from lung cancer in 1992. He was the first person I ever loved that died. I originally wrote the text for Smoke during a contemporary short fiction class in Fall 2006, attempting to emulate Barthelme. The short story is broken into several shorter passages, each with its own title, that represent different memories of my grandfather. "Edition size is three cartons of cigarettes." Tuscaloosa, Alabama: Perkolator Press, 2017. Edition of 15. 7.25 x 7" closed; tunnel book. Letterpress printed. Bound in paper over boards. Signed and numbered by the artist. 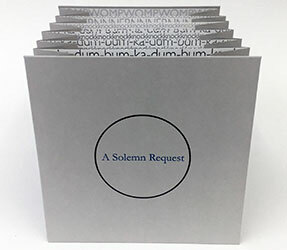 Amy Pirkle, colophon: "I printed 'A Solemn Request' during my time as artist-in-residence at The Anderson Center in Red Wing, Minnesota, in May 2017. I began working on this book idea after my identical twin sister was diagnosed with cancer, and my doctor recommended an MRI for me since I was considered high-risk." Amy Pirkle: "The idea for this tunnel book came to me while I was getting an MRI after my identical twin was diagnosed with cancer (my doctor recommended it since I was high-risk). The noises of the machine were overwhelming, but the longer I was in there, they began to fade and all I could hear was the repeating thought in my head, a solemn request that everything would be okay."